JDSU OMK-55 : Power Meters - Test Equipment Connection - Prüfgeräte zu verkaufen - verpachten - vermieten. JDSU OMK-55 Smart Optical Test Kit - A Smart, Future-Proof Optical Test Kit - JDSUs Smart optical handhelds go beyond the basics With more than 100,000 JDSU optical handhelds already in use, JDSU offers with the Smart Class the next generation of optical handhelds to help your network graduate to the highest level of performance. JDSUs Smart optical handhelds encompass a new, intelligent, and next level product line for testing all optical signals and systems, including broadband, PONs, and Gigabit Ethernet. An extended number of calibration wavelengths for the highest performance range in theindustry. A larger storage capability for up to 1000 results with automatic date/time stamp. An illuminated graphical display which shows up to 3 measurements simultaneously. A USB port for remote operation as well as easy Microsoft Excel?-based report generation and analysis. A unique power supply management system on the market with 4 different ways of powering the unit. 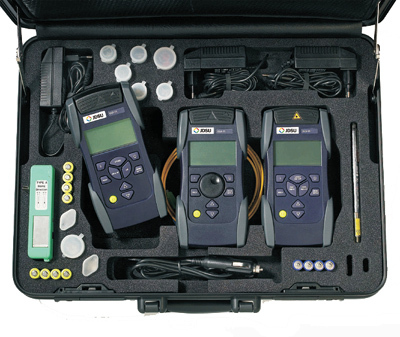 The OMK-55 Smart Optical Test Kit contains all of the tools, including instruments and accessories, necessary to perform professional-grade power or loss tests in the field. Each OMK-55 kit contains a combination of instruments that are specifically designed to meet your needs. Each OMK-55 kit includes an OLP-55 Smart Optical Power Meter, a high-performance optical power meter for testing, installing, and maintaining singlemode and multimode cables and networks. The Smart OLP-55 Optical Power Meter features auto-zeroing for auto dark current compensation to increase measurement accuracy. Each kit also includes an OLS-55 Smart Optical Laser Source. Different versions of the OLS-55 offer flexibility for testing, installing, and maintaining multimode as well as singlemode fiber systems in communications and CATV/multimedia networks. The kit allows you to have all the tools you need on site when you need them. The hard or soft carrying case allows for easy organization, protection, and transporting of your instruments and accessories.